This product is classified as ‘very high risk’ in nature due to its location and geopolitical situation of the region. 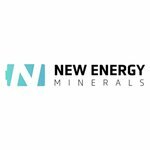 NextMiningBoom advises that extra caution should be taken when deciding whether to engage in this product, however if you are not sure whether it is suitable for you we suggest you seek independent financial advice. 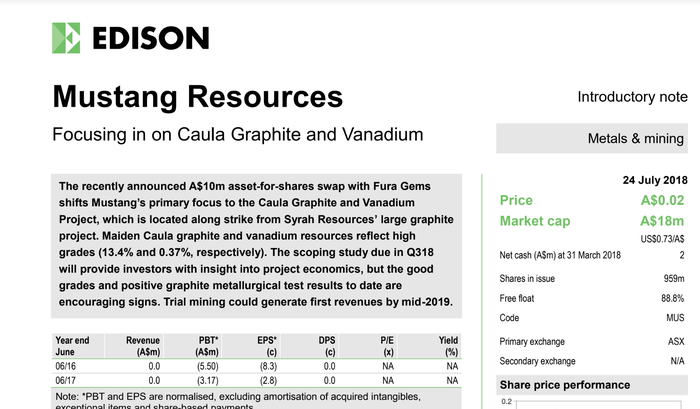 MUS is now seeing promising assay results roll in from exploration at its graphite-vanadium operations, resulting in its maiden JORC-compliant vanadium Mineral Resource estimate at its Caula Vanadium-Graphite Project. 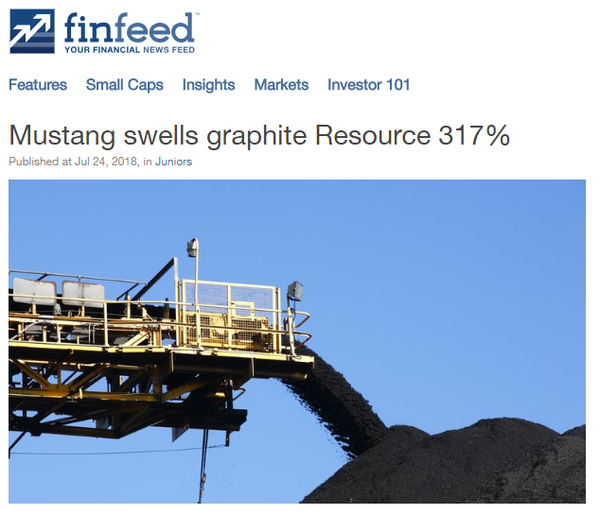 Mustang’s Project, located in northern Mozambique, is along strike from $865 million-capped Syrah Resources’ (ASX:SYR) Balama graphite project. And like Balama, the Caula deposit displays promising geology. It features relatively flat ground with encouraging geological characteristics in that the vanadium is hosted in a mica mineral, making it potentially simpler and cheaper to extract final 98%+ vanadium products than traditional titano-magnetite deposits. MUS delivered the maiden vanadium Resource last week, consisting of 22Mt at 0.37% vanadium pentoxide (V2O5), at a 0.2% grade cut-off, for a total of 81,600 tonnes of contained vanadium pentoxide all in the Measured category. 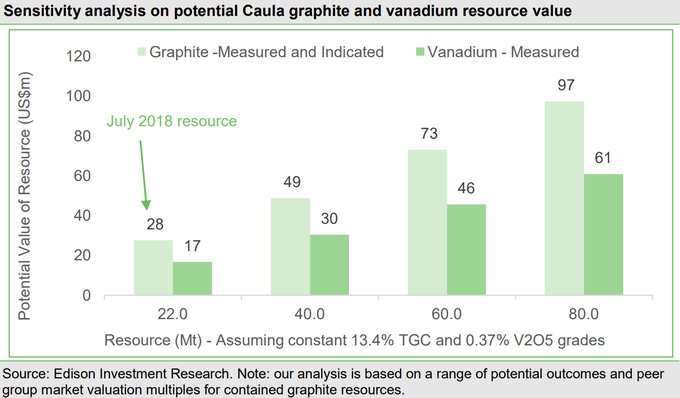 In addition to its maiden vanadium Resource, MUS also delivered a quadrupled graphite Mineral Resource estimate of 21.9 million metric tons at 13.4% Total Graphitic Carbon (TGC) for the Caula Graphite-Vanadium Project on Tuesday. The company now plans to complete a Scoping Study in the third quarter and a Definitive Feasibility Study (DFS) by the end of the calendar year in order to rapidly advance the project towards initial vanadium and graphite production in mid-2019. Recent results are highly encouraging and suggest that MUS is on track to meet it objectives. Earlier in the month, MUS received further high-grade assays from the final holes drilled as part of the Scoping Study on the Caula Graphite and Vanadium Project. These assays include intersections of up to 1.9% V2O5 and 28.9% TGC and contain multiple high-grade intersections over extensive widths and provide more strong evidence that Caula hosts extensive high-grade graphite mineralisation as well as highly promising vanadium mineralisation. The results also highlight the potential for Caula to be a world-class, low-cost graphite and vanadium supplier to the steel industry as well as the fast-growing rechargeable battery industry. This is important in terms of assessing MUS’s valuation compared with other stocks leveraged to the burgeoning battery industry. In fact, UK-based Edison Investment Research has valued the Caula Project alone at more than $60 million — a significant premium to the company’s current market cap of just $18 million. Such is the quality of the news emerging from the Caula Project that it has been front and centre over the last three months. Certainly Caula is now the focus following news that MUS had agreed to merge its Montepuez ruby assets with Fura Gems Inc. (TSX-V:FURA) for A$10 million in Fura shares, plus a A$25 million spending commitment from Fura on the ruby assets over the next three years. The deal will give MUS shareholders significant exposure to the rapidly growing ruby and emerald markets via a specialist gem company with extensive experience and a diversified asset base in the coloured gemstone industry. It also means that Mustang can focus all its attention on the world-class Caula project knowing that the ruby assets are fully funded for the next three years. So let’s get a handle on the key value drivers that could be significant in terms of share price performance, particularly given management is hoping to bring the Caula project into production in 12 months. 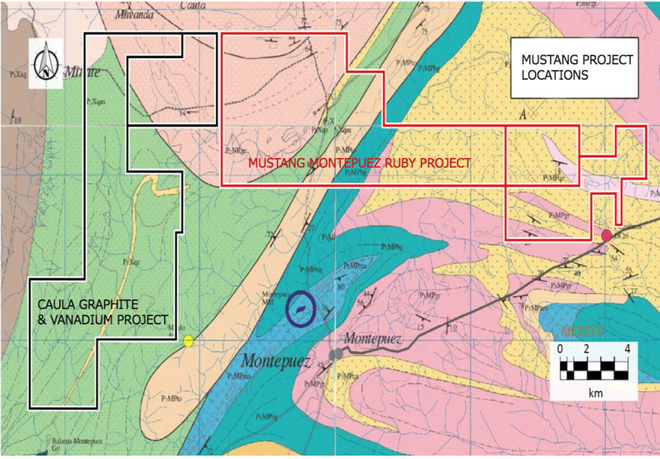 When we last outlined Mustang Resources’ (ASX:MUS) impressive portfolio of assets it was evident that the group had premium projects in highly prospective locations, and that upcoming exploration could well be a defining point for the stock. As can be seen on the map below, MUS’s Caula Graphite-Vanadium Project lies in the Cabo Delgado Province of northern Mozambique, neighbouring its Montepuez Ruby Project. MUS is fast-tracking the development of this highly prospective project, with its most recent news centring on Caula Graphite-Vanadium Project. The company continues to progress through the exploration stage at Caula and is fast tracking towards first production in mid-2019. MUS’s Caula Project now hosts a maiden JORC Inferred Resource of 21.9 Mt at 13.4% TGC (8% cut-off) for a total of 2,933,100 tonnes of contained graphite. Significantly, this upgraded Resource represents a 317% increase in the size from 702,600 tonnes of contained graphite (as estimated in December 2017) to 2,933,100 tonnes of contained graphite. As for the project’s vanadium prospects, MUS has now completed its maiden JORC-compliant vanadium Mineral Resource estimate. The estimate is in the Measured category, with excellent numbers including 22Mt at 0.37% vanadium pentoxide (V2O5), at a 0.2% grade cut-off, for a total of 81,600 tonnes of contained vanadium pentoxide — worth around US$3.2 billion at today’s vanadium prices. This maiden vanadium Resource is another key step towards development for MUS and adds to the recently upgraded graphite Resource at Caula of 21.9Mt at 13.4% TGC. 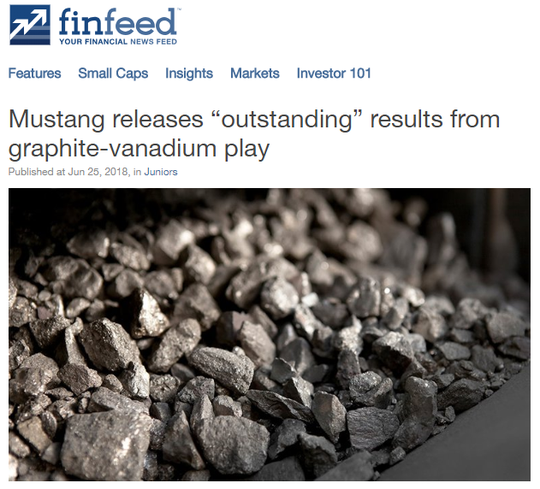 Importantly, the results from both the graphite and vanadium sampling have exceeded expectations. 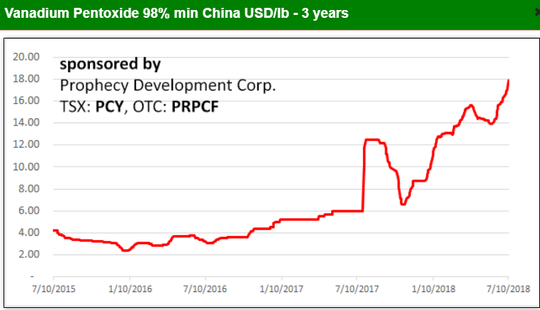 Running in tandem with these developments has been a surge in the vanadium price, which will add to the economic viability of the Caula Project... and to the appeal of MUS to investors. 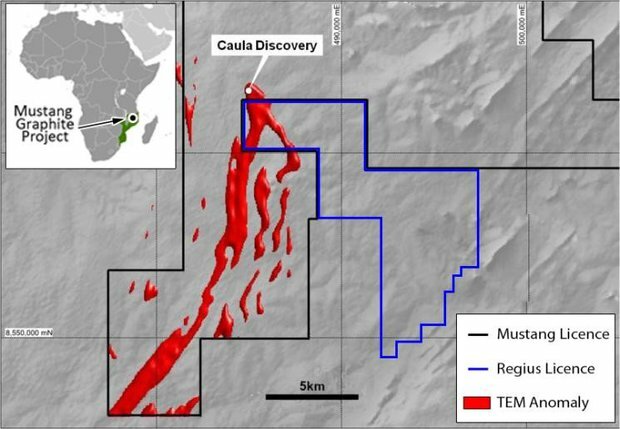 When MUS releases the Scoping Study that’s due in the third quarter, it expects to be able to provide more clarity around the potential for Caula to emerge as one of the lowest cost graphite projects in Africa. Recent exploration data has provided a hint of what may be to come when the Caula graphite and vanadium Resource figures are released. These figures will feed into the scoping study, providing investors with a reasonable insight as to what to expect. Caula has a distinct benefit in being a multi-commodity project, particularly at a time when the vanadium price is surging and the medium to long-term outlook for battery materials is buoyant. These products have applications in both the expandable graphite and lithium battery markets, particularly for electric vehicles. Additionally, for now the global steel industry primarily drives demand for both graphite and vanadium at present so the projected growth in steel production should significantly drive demand for graphite and vanadium in the shorter term at least. An important factor when it comes to mining projects is related to costs. On this note, the high grade of Caula graphite, along with revenues from vanadium production, could enable MUS to generate a quality product at a low cost, maximizing margins and providing protection against price volatility. While the company’s market cap remains at just $18 million, it seems that the quality of MUS’s results at Caula and the continually improving value of the assets haven’t been lost on the corporate sector either. The investment research group noted that on average, graphite exploration and development companies trade at a multiple of US$9.36 per tonne of in-situ graphite contained in Measured and Indicated Resources, while vanadium companies trade at an average of US$205.49/t per tonne of in-situ vanadium in Measured Resources. Applying these multiples to Caula’s graphite and vanadium Resources, respectively, Edison came up with a valuation for graphite of US$27.5m (A$37.5m), and for vanadium of US$16.8m (A$22.9m). This brings its total to A$60.3 million. As seen in the chart below, Edison has forecast a range of potential longer-term value outcomes for the Caula graphite and vanadium project if further drilling continues to increase the size of the Resource base. 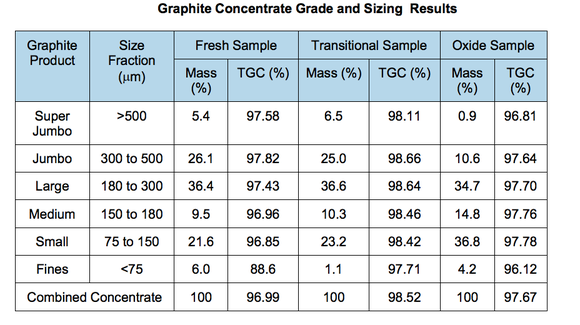 For the purposes of this sensitivity analysis, Edison assumed that graphite grade remains 13.4% TGC and vanadium grade remains 0.37% V2O5. Of course any change to the grade would either increase or reduce the contained graphite and vanadium, along with the potential value. Analysts from US-based consulting firm RB Milestone Group LLC (RBMG) highlighted the quality of the Caula Project in a research paper delivered in late June. In summing up the project, the group recognised that MUS’s Caula Project hosts high-grade shallow graphite with substantial flake size distribution and recoveries. Again, broker projections and targets are only estimates and may not be met. Those considering this stock should seek independent financial advice. Further, as seen in the chart below, RBMG have positioned MUS at the upper right-hand corner of the chart due to its high-grade graphite (TGC%) contents and large flake size. 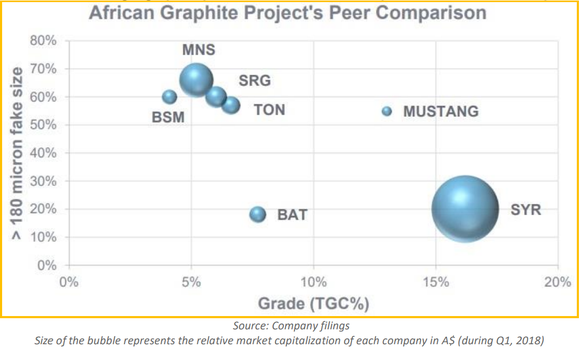 As a result, it is noted that MUS, with its high grade graphite and large flake size, has huge potential to become a strong graphite supplier when compared to its peers in the East Africa region. 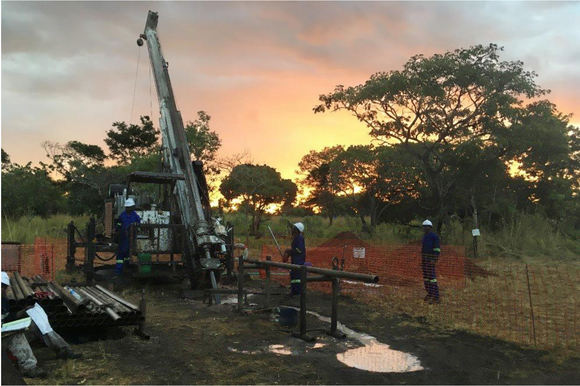 Pending the results of the scoping study, management is committed to fast-tracking the Caula Project’s development, and providing that upcoming studies go to plan MUS is targeting first graphite production by mid-2019. MUS anticipates that from the start of operations, vanadium will also be extracted to a concentrate, which will either be sold to vanadium producers or stockpiled for future production of refined vanadium pentoxide chemicals. The subsequent definitive feasibility study (DFS) will get into the real number crunching, providing an insight into what could be expected in terms of mine life, earnings projections, internal rate of return and capital expenditure. This is a crucial stage for companies as it is a time when management has a fair grasp on a project’s likely production potential, as well as the upfront costs to bring the mine into production. This data comes into play when negotiating offtake agreements and determining funding options, with the former being a potential share price catalyst, given that it provides a degree of certainty in terms of revenue generation. Similarly, finalising funding options, perhaps by way of debt, equity and joint ventures de-risks the project, providing a clear picture of the prevailing economics. If all goes to plan and production gets underway by mid-2019, many of these developments will be occurring in the next six months or so, potentially providing multiple catalysts...as outlined below. Ongoing positive exploration news suggests that imminent releases over the coming six months could be even more material in terms of potential share price catalysts. 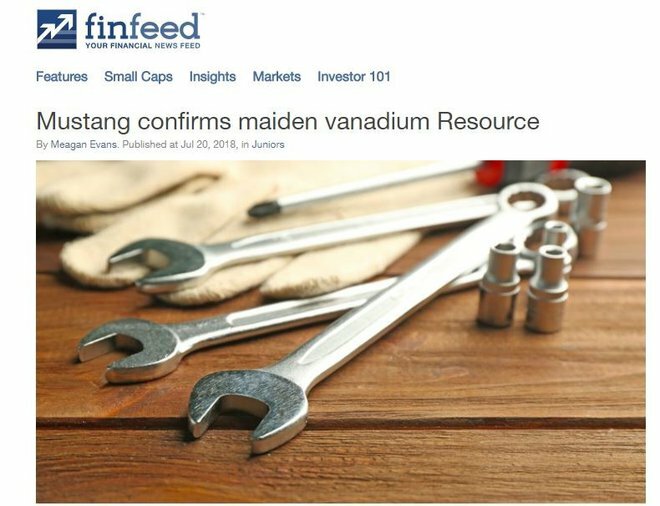 The first of these potentially market moving announcements has now occurred with the Maiden Vanadium Resource and also the Upgraded Graphite Resource just released, with the scoping study to be completed soon after. This is expected to then lead into full commercial-scale mining operations during the first half of 2019. Impressive recent news out of the Caula Project has so far seemed to fly under the radar of investors, not generating the degree of share price traction which might be expected. Furthermore, players in the battery materials sector have been rallying strongly based on results that are well shy of those being delivered by MUS. This may have something to do with MUS’s existing classification as a ruby producer which is set to change with the strategic Fura ruby asset merger. Yet with a market capitalisation of just $18 million there appears to be plenty of upside potential still to be factored in.